Yvonne. Really? This is ridiculously beautiful. 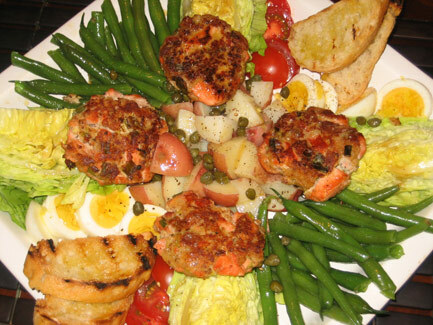 I'm going to make the salmon cakes this weekend. Have you heard of Food52.com? I'm thinking you could win every contest. I know what I am trying to make this weekend. Good to see you are still cooking. Well of course it is amazing!. I used to make a nicoise salad that i found in London. Instead of Salmon, there was a small steamed lobster tail ( served cold) black olives, BASIL, potatoes, blanched Green beans and so on,,, come over one weekend, i will make it! I owe you for the slamon patties that were soooo good!